I love cream cheese. It’s the only way I will eat a bagel. I put it with salsa and dip tortilla chips in it. I love it as a frosting. I could practically eat it plain. Even with all of that said, I’m not a huge fan of cheesecake. Maybe its just too sweet or too dense, but I will rarely ever eat a slice of cheesecake, even if its with chocolate or fruit. But something told me I should really make this recipe. Maybe its because the recipe includes raspberries and with the cooler weather taking over, I needed a reminder of summer. Or maybe because I can handle small doses of cheesecake and a cupcake size sounded perfect. 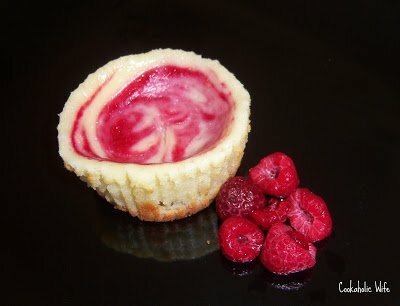 The one thing I forgot before making these is that cheesecake needs to be refrigerated. I usually avoid recipes that call for refrigeration because we have a tiny fridge (stupid apartment complex) and it is usually full with just the basics that we pick up from the grocery store. But, since we’re going to the store today I only needed to move a few things around to make space to refrigerate these. Oh, and don’t forget in order to make this recipe you’ll need the cream cheese and eggs and room temperature. 1. Preheat the oven to 325. Line the cupcake tins with paper liners. 2. In a small bowl, combine the graham cracker crumbs, butter and sugar. Stir together until the mixture is moist. 3. Scoop 1 tbs. of the graham cracker mixture into each cupcake liner. Press down with a glass. Bake for 5 minutes and the transfer to a cooling rack while you make the other parts of the recipe. 4. Rinse off the raspberries and put them into a blender or food processor. Add the sugar and pulse until smooth. Pour the mixture through a fine mesh sieve to strain out all of the seeds. 5. For the cheesecake portion, beat the cream cheese on medium-high speed in a stand mixer until fluffy. Add the sugar in and process until smooth. Add the salt and vanilla. Then beat in the eggs, one at a time, mixing well after each egg. 6. Spoon 2 tablespoons of the cream cheese mixture into the cupcake liners. Add 1/2 tsp. of the raspberry puree to the liners. Use a toothpick to swirl around. 7. Bake for 12 minutes and then rotate the pans. Bake for another 12-15 minutes or until the filling has set. 8. Transfer to a cooling rack and let them come to room temperature, then refrigerate for at least 4 hours.